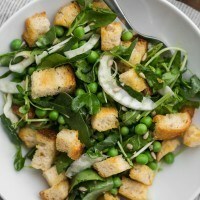 Spring Panzanella with Peas and Fennel | Naturally.Spring Panzanella with Peas and Fennel | Naturally. To make the salad: Combine the fennel, peas, pea shoots, sunflower seeds, and garlic in a bowl. Make the dressing by combining the ingredients in a bowl and whisking together. Pour the dressing over the fennel mixture and let sit while finishing the salad. Toss together the cubed bread, olive oil, salt, and pepper. Spread into a single layer on a sheet tray and bake until crisp, 12 to 14 minutes. Remove from the oven and cool slightly. Fold the toasted bread into the fennel mixture and serve over the spinach. + If you can’t find garlic scapes, use a couple chopped scallions.